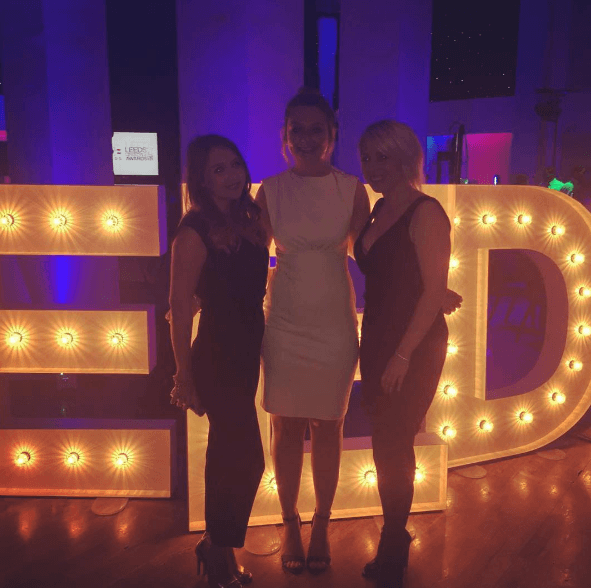 Our lovely client, The Light invited the team to join them at the event – consisting of a rather lengthy awards ceremony, music and three course meal, not to mention copious amounts of wine! So the guys got dressed up and went down to show the tenants some support and, naturally, see what all the fuss was about. The Light had a huge five of its tenants on the final shortlist, La Bottega Milanese for Best Coffee Shop, Radisson Blu for Best Hotel, Nuffield for Best Fitness Facility, Fabrication for Best Fashion Retailer and Firelake for Best Bar… Phew! It was a glamorous affair, with lots of fake tan, white teeth and even a brief celebrity visit from Simon Cowell’s sidekick, Sinitta. Also a bit of a surprise was the fact that the whole event was streamed live on Made in Leeds TV – cue the wine! With all of the amazing establishments up for nomination, the competition was extremely high, so we were all overwhelmed when La Bottega Milanese was announced as the winner of the Best Coffee Shop in the whole of Leeds, although well-deserved in our humble opinion!